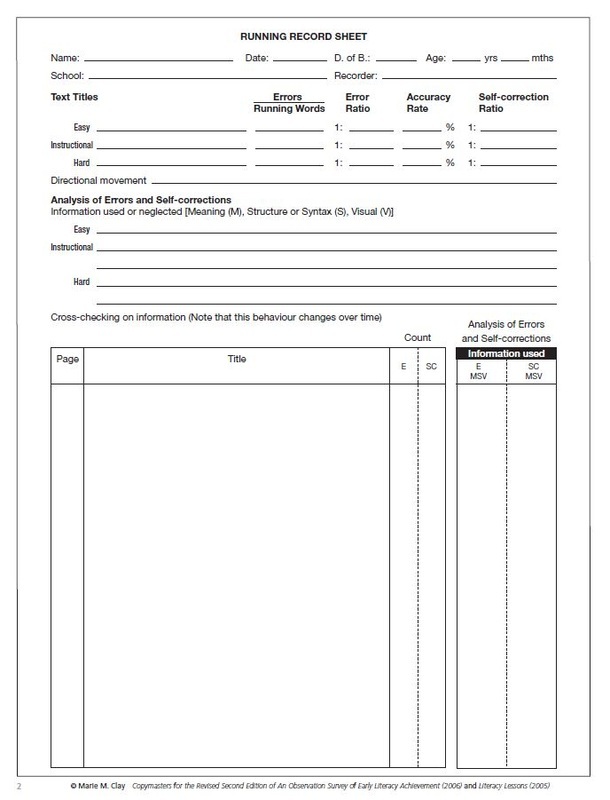 Running records are formative assessments used with children that allow you to see what strategic actions they are using during their oral reading. Running records also allow you to see error patterns which will inform your future teaching decisions. Running records are quick and easy to administer. You are able to look closely at each student’s reading frequently and therefore provide teaching that is responsive and timely to their needs. To take a running record you sit next to a child, listen to the child read a text, and record their reading using running record coding on a blank sheet of paper or a running record form. allow you to work in a child’s instructional level (your students aren’t going to learn how to take on more complex text if they are consistently working in books that are too hard or too easy). give you specific information regarding your students’ reading behaviors that you can share with families during conference time. Running Records are vital for informing your reading instruction. Without running records, you will not have systematic records that show the effectiveness of your teaching. Without running records, you will not be able to be responsive to your students’ needs which will delay their progress toward reading increasingly complex texts. 100 Positive Experiences: #1 Be on time. Every time.